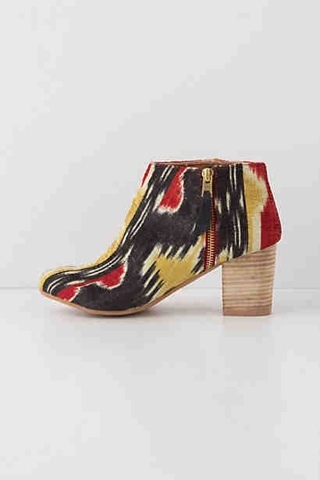 Today's So Shoe Me is the Ikat Ankle Boot by Miss Albright, $178, available at Anthropologie. A casual ankle boot with a bold boho print will add an exotic edge to everyday separates. The two-tone color-way on the inside and outside add instant print mixing for easy pattern perfection. Wipe and go with this easy to clean fabric upper and explore new heights with this chunky block heel. Pair these cute printed boots with some mustard cords, a denim shirt and cozy knit for the perfect layered look this winter. 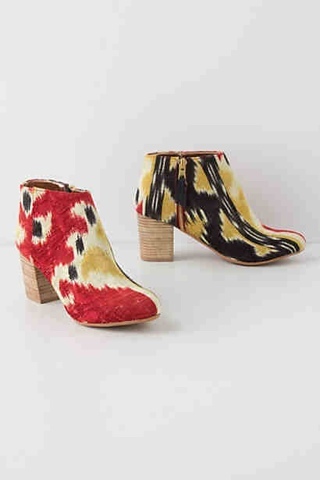 So Shoe Me a pair of ikat-ching booties that will add the perfect pop of color and print to my favorite basics this winter.